More than a month after heavy flooding struck central Vietnam, hundreds of thousands of residents are still feeling the impact. 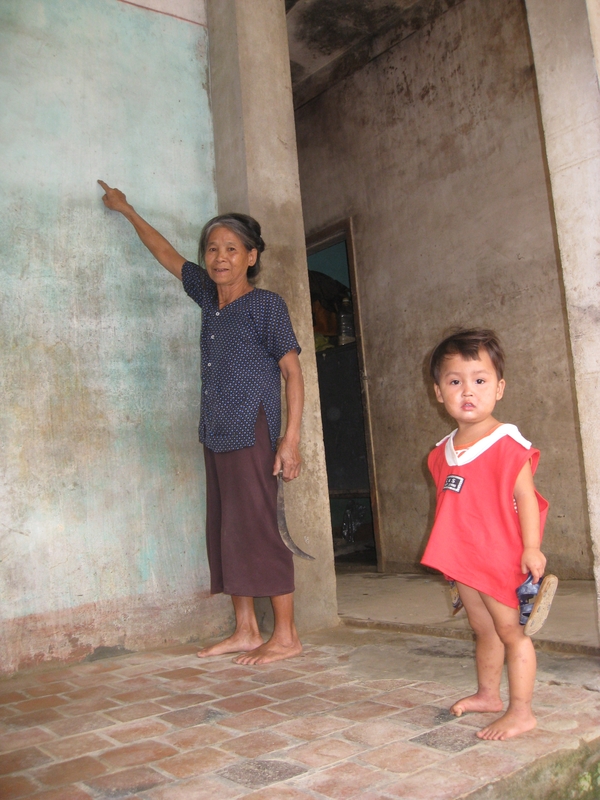 "I never saw flooding like this before," Lien Le Thi, 72, told IRIN in the village of Ton Le in Vu Quang District in Ha Tinh Province, gesturing towards the water line left by the receding floods on the wall of her house. "I lost everything, including my livestock and seeds. What am I supposed to do now?" More than 250,000 homes were submerged and close to 200 were destroyed by the flooding on 1-6 October and 14-18 October. Thousands of families were forced to evacuate and at least 143 people were reported dead, the government said. Of the five affected provinces - Nghe An, Ha Tinh, Quang Binh, Quang Tri and Thua Thien Hue - Ha Tinh was the worst affected. About 80 percent of the province's annual rainfall fell in just 10 days, authorities say. More than half a million people were affected in Ha Tinh or approximately 70 percent of the population in this largely agricultural, impoverished area adjacent to the Lao border. Flooding is nothing new in central Vietnam but this year was particularly bad, pushing local coping mechanisms to their limit, aid workers say. Residents who regularly would store their food stocks in attics in the event of flooding saw them washed away, while others lost their autumn crops, household belongings, tools and seeds for the next planting season. "It will take about one to one-and-a-half years for communities to return to normal," Dao Ngoc Ninh, emergency response coordinator for ActionAid, which is working in two districts of Ha Tinh, told IRIN. In addition to infrastructure damage to roads, bridges, canals, 2,000 hectares out of 3,000ha of Vu Quang District's rice paddy was lost, he said, warning that communities would likely face food shortages before the next rice crop harvest in May 2011. Despite relief efforts by the government and Vietnam Red Cross, putting communities back on their feet will require further interventions, he said. Most affected farmers are receiving short-term food assistance (one to three months), but the food gap is significantly bigger, Oxfam noted. "The primary needs at this point are food security over the next three to five months, as well as livelihoods," Oxfam's emergency response manager, Viet Vu Xuan, explained. Although communities will be able to get by for the next one or two months, they remain at risk of further food and livelihood insecurity unless additional interventions are made. The best scenario for agricultural recovery would be to provide agricultural inputs for coming winter spring crop seasons - in particular seeds and fertilizer, Puspasari Indra, regional emergency food security and livelihood coordinator for Oxfam, said. Of the region's three crop seasons, the winter spring season (November to April) was the most important, accounting for approximately 70 percent of the total year's output. The rice, maize, sweet potatoes, beans and peanuts crop would be undermined unless additional assistance was forthcoming, Indra said. Added to that are increased community expenditures and the coming Chinese New Year, which will likely place additional financial strains on family resources. According to Oxfam, the recovery of income and food sources may require three to six months until the harvest of the winter-spring season. "The impact of this flood will be quite long," Provash Mondal, humanitarian programme coordinator for Oxfam in Vietnam, warned. "Some families may need more than five years to recover their livelihood losses."